Columba was born into a royal clan in Donegal, Ireland. He called Christ “his druid,” or teacher. 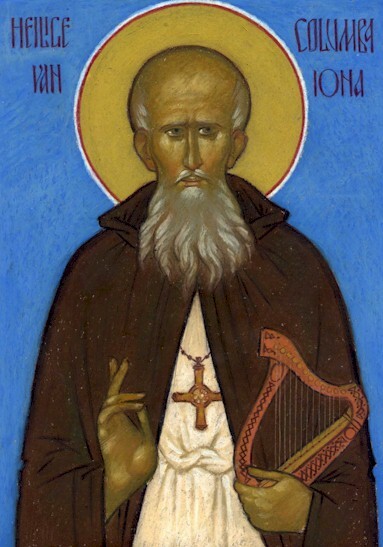 Columcille, his Irish name, or Columba, as he is known in Latin Britain, founded the monasteries of Derry and Durrow in his native Ireland, and the island monastery of Iona on the coast of Scotland. Iona was the center of operations for the conversion of the Scots and Picts, and became the most famous monastic complex in Scotland. There Columba baptized Brude, King of the Picts, and later a King of the Scots came to this Abbot of the "Holy Isle" for baptism. All of these monasteries had oak groves, the favorite trees of the druids. He was a scholar and writer who found great joy in solitude. A sixth century poem describes him as a gentle sage “with faith in Christ,” and states that “being a priest was but one of his callings.” Adomnan, an early biographer, writes, “Angelic in appearance, elegant in address, holy in work, he would never spend the space of even one hour without study or prayer or writing.” He radiated a divine and celestial light, and is known for the booming power of his voice, and for his amazing authority over the winds and seas and all the natural world. He had such a deep love for the woods and for all of God’s creation that he made sure that his monastery was built without a tree being cut down. In one of his poems, he wrote that he was more afraid of the sound of an axe in Derrywood, a nearby forest, than he was of the voice of hell itself. 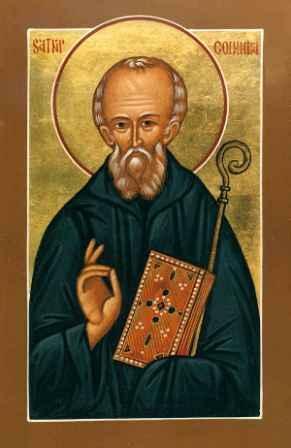 Having founded what is reputed to be the largest monastery in Christendom on the coastal island of Iona, which became a great center of learning and from which monasticism spread throughout Northern Europe, Columba died on Iona in 597. Chronicles of his life appeared in the following century, most notably from Saint Adomnan, who attributed to him many prophecies, visions and miracles, not least of which was warding off the Loch Ness monster with the sign of the cross. In the year of our Lord 565, when Justin the Younger, the successor of Justinian, had the government of the Roman Empire, there came into Britain a famous priest and abbot, a monk by habit and life, whose name was Columba, to preach the word of God to the provinces of the northern Picts, who are separated from the southern parts by steep and rugged mountains; for the southern Picts, who dwell on this side of those mountains, had long before, as is reported, forsaken the errors of idolatry, and embraced the truth, by the preaching of Ninias, a most reverend bishop and holy man of the British nation, who had been regularly instructed at Rome, in the faith and mysteries of the truth; whose episcopal see, named after Saint Martin the bishop, and famous for a stately church (wherein he and many other saints rest in the body), is still in existence among the English nation. The place belongs to the province of the Bernicians, and is generally called the White House, because he there built a church of stone, which was not usual among the Britons. Columba came into Britain in the ninth year of the reign of Brude, who was the son of Meilochon, and the powerful king of the Pictish nation, and he converted that nation to the faith of Christ, by his preaching and example, whereupon he also received of them the aforesaid island for a monastery, for it is not very large, but contains about five families, according to the English computation. His successors hold the island to this day; he was also buried therein, having died at the age of seventy-seven, about thirty-two years after he came into Britain to preach. Before he passed over into Britain, he had built a noble monastery in Ireland, which, from the great number of oaks, is in the Scottish tongue called Dearmach - The Field of Oaks. From both of these monasteries, many others had their beginning through his disciples, both in Britain and Ireland; but the monastery in the island where his body lies, is the principal of them all. That island has for its ruler an abbot, who is a priest, to whose direction all the province, and even the bishops, contrary to the usual method, are subject, according to the example of their first teacher, who was not a bishop, but a priest and monk; of whose life and discourses some Writings are said to be preserved by his disciples. But whatsoever he was himself, this we know for certain, that he left successors renowned for their continency, their love of God, and observance of monastic rules. It is true they followed uncertain rules in their observance of the great festival, as having none to bring them the synodal decrees for the observance of Easter, by reason of their being so far away from the rest of the world; wherefore they only practiced such works of piety and chastity as they could learn from the prophetical, evangelical, and apostolical writings. This manner of keeping Easter continued among them for the space of 150 years, till the year of our Lord's incarnation 715. By thy God-inspired life, thou didst embody both the mission and the dispersion of the Church, most glorious Father Columcille. Using thy repentance and voluntary exile, Christ our God raised thee up as a beacon of the true faith, an Apostle to the heathen and an indicator of the way of salvation. Wherefore O holy one, cease not to intercede for us, that our souls may be saved. A fearless accuser of sin and avenger of the injured, thou in repentance didst accept exile in a distant land, keeping the strait and afflicted path of obedience in the monastic rule. Thou didst cast the cloak of love over the failings of the feeble. 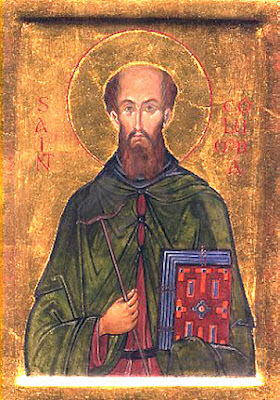 A lover of chant, thou didst rejoice in the creation, whilst hymning the Creator, and didst command thy followers to be at peace and have love among themselves, O gracious Columba. O Thou prince of Celts and founder of monasteries, in obedience to the revelation of the Archangel Michael, thou didst endure exile and in so doing didst carry the faith to the unenlightened. As one who received the grace of illumination by the light of the Holy Spirit, grant that the hearts of us sinners may be purified by His radiance. Intercede thou that peace may rule throughout thy land and the whole world, and forget not thine erring children, O holy Father Columba.